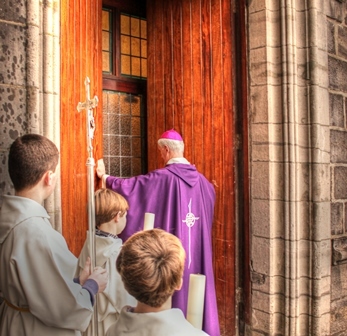 Opening of the Holy Door in St. Muredach’s Cathedral, Ballina. Extra-ordinary Jubilee of Mercy – December 13th 2015. This morning we are living through a truly historic moment in the history of the Church. For the first time in history a Holy Door will be opened in every cathedral throughout the world during these twenty four hours. From sunrise in Sydney to sunset in San Diego, over 3,500 bishops will open a Holy Door in their cathedrals. This morning, therefore, as we open the Door of Mercy in this cathedral we form a link in the chain which encircles the entire world. We become truly conscious of the fact that we are not alone. We are part of the Universal Church spread throughout the world. The Door of Mercy, which will remain open until the Feast of Christ the King next November, reminds us of two things; the openness of God to all of us and the openness which all of us should have to God and to one another. Pope Francis captures this in two very telling phrases. He talks to us of ‘mercy as the bridge that connects God and man, opening our hearts to the hope of being loved forever despite our sinfulness.’ And he also talks to us of God’s love in very human terms. He says; “It is indeed my wish that the Jubilee be a living experience of the closeness of the Father, whose tenderness is almost tangible, so that the faith of every believer may be strengthened”. Just take that phrase and think about it; ‘ the closeness of the Father, whose tenderness is almost tangible.’ My hope is that as you walk through the Holy Door during this year you will come to experience within the walls of this cathedral the closeness of the Father to you and his tenderness which is almost tangible. Pope Francis also talks to us of mercy as ‘the fundamental law that dwells in the heart of every person who looks sincerely into the eyes of his brothers and sisters on the path of life.’ And what he is saying to us in this phrase is; if only people would look at each other through the eyes of mercy then we would transform our world completely. The massacre in Paris on November 13th would never have taken place. The challenges presented by climate change, where people throughout the world suffer from flooding, including ourselves, from drought and from all kinds of natural disasters, would never take place because we would all do what we know we should do about the way we live and the effect this has on the world in which we live. And bringing mercy down to our own lives; gossip, rumour spreading, unfair criticism, unjust work practices and so on would cease because each of us would look at each other through the eyes of mercy and see another human being who deserves to be loved and respected absolutely. The Door of Mercy, the open door of this cathedral, says to every one of us; no matter how long it is since you were inside a church; no matter how far removed from the Church you feel yourself to be; no matter how unworthy you think you are, you are most welcome. Furthermore, the Pope is saying to us that in the Church we will find the mercy of God. “It is indeed my wish that the Jubilee be a living experience of the closeness of the Father, whose tenderness is almost tangible, so that the faith of every believer may be strengthened”.